Companion Animal and Livestock combined meet the complete needs of veterinary surgeons working in mixed animal practices. These peer-reviewed journals address small and large animal practice respectively, so no matter what species you encounter, your clinical knowledge will be up-to-date. 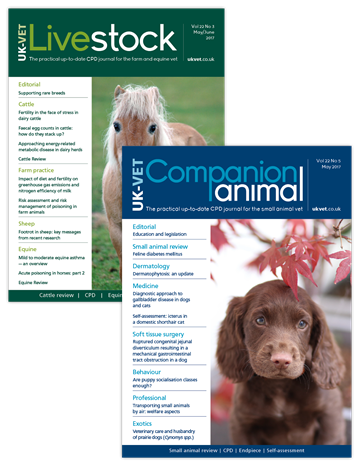 Both titles publish evidence-based clinical reviews, case reports, self-assessment articles and research summaries, providing practical information to support continued education, and establish best practice in veterinary medicine and surgery. They also include online CPD programmes, helping subscribers stay ahead of their CPD requirements. If you are interested in a practice subscription, which provides print journals, online archive access and CPD licenses for your staff, please contact our subscriptions team by emailing subscriptions@markallengroup.com or calling 0800 137 201.